I use to advise the use of any kind of fresh juice as part of the program. I've changed my mind a little on this topic. Although, freshly squeezed or juiced fruit and vegetables are a top way to boost your intake of essential vitamins, minerals, enzymes and micro-nutrients. 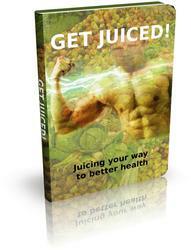 I've found that too much juice without the added fiber can cause jumps in your blood sugar levels. This can affect some people just like eating processed sugar. Because of this I don't drink fresh fruit juice as part of my regular diet. Unless it's a lower sugar fruit like watermelon or diluted with water such as the Spartan Sports Drink below. Or unless I'm on a juice fast. The most important secret about fruit/vegetable juice is it must be FRESH. That means juiced from whole fruit, preferably juiced by you then drunk as soon as possible. You see, once fruit has been juiced the important nutrients start to break down very quickly. Refrigerating will make it last longer.